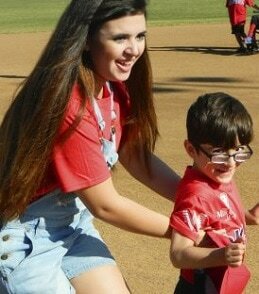 The Miracle League of Corpus Christi is a non-profit organization focused on providing a safe and enjoyable experience for kids (ages 5-17) and adults (ages 18 & up) with mental and/or physical disabilities regardless of his or her experience, or level of ability. ​The Miracle League of Corpus Christi is a non-profit organization focused on providing a safe and enjoyable experience for kids and adults with mental and/or physical disabilities regardless of his or her experience, or level of ability. Players as young as 5 years old are welcome. We have a youth league (ages 5 to 17), and adult league (ages 18 and up). We offer baseball, adaptive zumba, kickball, basketball, summer camp, and beginner swim lessons. ​There are many opportunities to become a sponsor. If your company, organization, or you as an individual donor, are interested in becoming a sponsor for organization, league, team, or player, please click here to learn more.